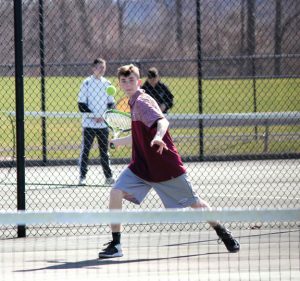 NAUGATUCK — The Naugatuck boys tennis team is learning how to battle through some hotly-contested matches. The Greyhounds opened the season with a pair of 5-0 wins over Crosby and Wilby, before falling to Pomperaug, 4-1, in an out-of-league match. Naugatuck got back to Naugatuck Valley League play last week, picking up three wins to improve to 5-1 on the season. The Greyhounds handed Watertown its first loss of the season, 4-1, on April 9. Naugatuck’s Chris Cook went to three sets before getting past Casey Butwell, 6-4, 4-6, 10-6. Jared Montini won a tie breaker 7-6 (9-7) and a 6-0, and Jay Mezzo earned a 6-1, 6-3 sweep to assure the Greyhounds’ win. The doubles team of Brandon Sampaio and Andres Maldonado took a pair of 6-0 decisions, and the team of D.J. Fine and Ray Hess dropped a close 4-6, 5-7 decision. 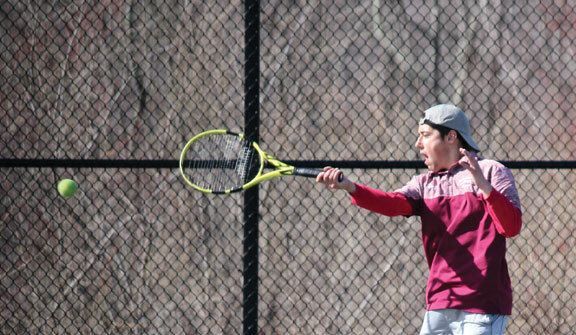 Naugatuck faced another stiff test against Woodland April 10 and pulled out a 3-2 win. Montini got by Dante Polletta 6-1, 6-2, and Jay Mezzo battled past Austin Roberts, 6-3, 7-5, to give Naugy a 2-1 advantage heading into doubles. The Greyhounds pulled out a close with the team of Fine and Jonathan Vincent earning a 7-5, 6-4 victory in the No. 2 doubles match. “We just faced two real tough teams and were fortunate to come out with the wins,” said Hayward about the Watertown and Woodland matches. Naugatuck earned its third win in three days by beating Torrington on April 11. Cook and Montini won singles matches, and the teams of Sampaio and Maldonado and Fine and Vincent won in doubles play. Naugatuck is set to play Holy Cross on Wednesday.